At this time of year, it can be easy to feel the holiday blues – lots of couples walking the streets hand in hand, happily preparing for Christmas. It can make the singletons out there crave a little bit of companionship of their own. If that craving turns into desperation, it’s only a matter of time before all normal social conventions are thrown out of the window and that poor desperado will flirt anywhere and everywhere, whether it is a good idea or not. 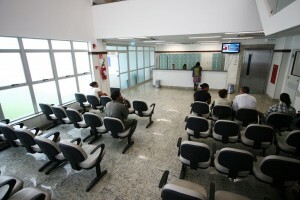 The Hospital Waiting Room – The waiting room of a hospital is an awkward place to be, so why would you make it more awkward by trying to flirt with a fellow patient/visitor. When someone is waiting for what may be a rather important diagnostic test, I’m sure they have enough on their plates, without having to fend off the ill-timed advices of a randy moron. A funeral – Flirting is about as inappropriate as dancing on the grave of the dearly departed, it is just something that you don’t do. No matter how hot someone looks in all black, do not approach them and drop a a chat up line on them, just leave them to their grief and think ‘better luck next time’. The Underwear Section Of A Department Store – If you want to exude a creep vibe, head to the nearest department store and hang out in the underwear section, hoping to strike up a conversation with an innocent shopper. It will be a miracle if you aren’t unceremoniously thrown out of the establishment by a couple of in–store security. On A Date With Someone Else – Even if that date is a completely horrible and you both know it, you don’t put the moves on someone else – there isn’t much tackier than that. At least see your awful date home, before you go scouting for the next one. A Job Interview – If you don’t realise why you shouldn’t flirt in a job interview, I’m not sure you’re safe to be in the workplace. If you really find your interviewer irresistible, do your best to get the job and then make your move at the Christmas Party, anything goes at those things. If you know of any more places, or situations, where you definitely should not flirt, feel free to leave us a comment. For some more flirting fun or another chance to meet some new people, check out our Facebook Page.